10 GB 3 Months of Free Hosting | Free Hosting | All Free Web Resources for Designer - Web Design Hot! 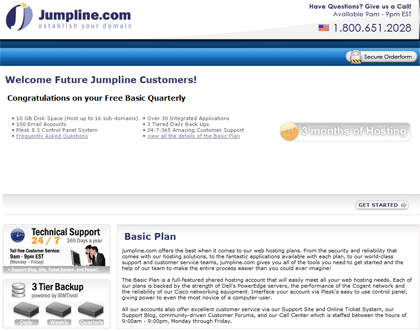 Founded in 1997, Jumpline.com, Inc. has been servicing over 75,000 small business owner’s web hosting needs.Jumpline.com offers every level of web hosting from simple shared solutions up to complex (VPS) and dedicated servers. This entry was posted on Wednesday, April 22nd, 2009 at 12:52 am and is filed under Free Hosting . You can follow any responses to this entry through the RSS 2.0 feed. You can leave a response, or trackback from your own site.